Flat Sidewalks in San Francisco? A really fun project by photographer Dan Ng, The Streets of San Francisco ... But Flat? 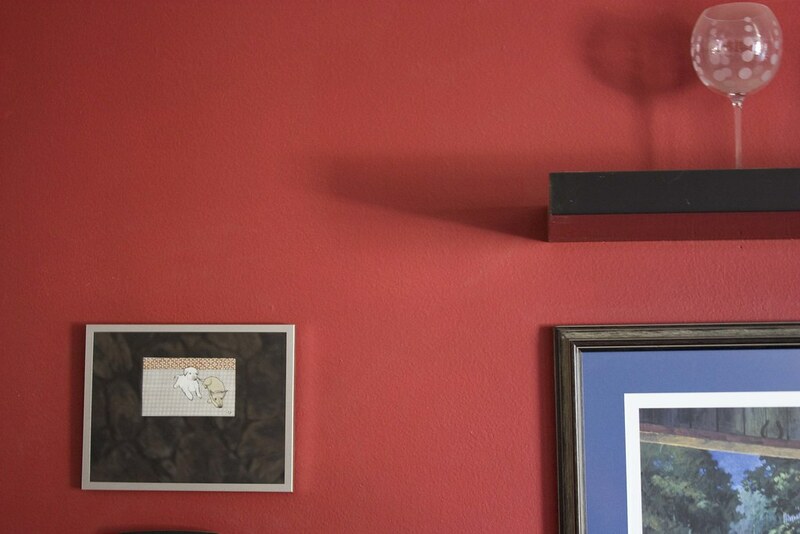 has photos framed level with the sidewalks instead of with the buildings. It's a neat take on some classic San Francisco scenes. Paintings from Mark Rothko, Joan Mitchell, and Jackson Pollock are set on an awesome collection of stamps. I think they're too pretty to mail, and $4.40 makes for a really cheap way to get some master paintings. I think I'll get a set and hang it on the wall. tagged art, design of the day, news? Last month Albert Giacometti's famous statue won the award of being the most expensive piece of art ever sold bringing in a whopping $104,300,000 at auction. Isn't it fascinating that art can still bring in record dollar amounts in the worst economic conditions since the Great Depression? GOOD magazine created a great infographic showing the top ten most expensive pieces of art on the ever sold and the rest of the dollar amounts are just as staggering. I had always dreamed of one day owning a van Gogh or a Renoir but it seems like I'll be settling for some stuff I find on Etsy. Wow. Last week I took a day off and toured the Los Angeles County Art Museum. I went by myself and I really enjoyed wandering quietly through the halls. It gave me more time to ponder what a piece meant to me and decide what I wanted to take away from the whole experience. Because art is about the experience, right? And the experience starts outside. 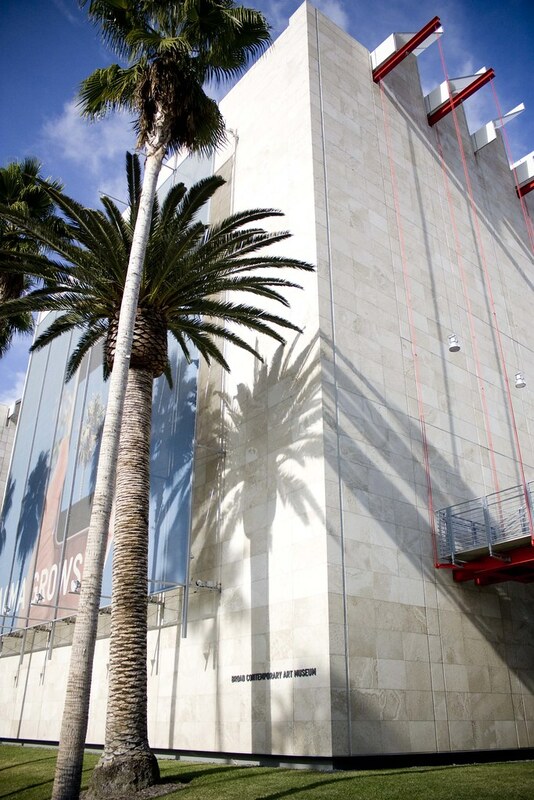 The five museum buildings sit proudly along palm-tree-lined Wilshire Boulevard. 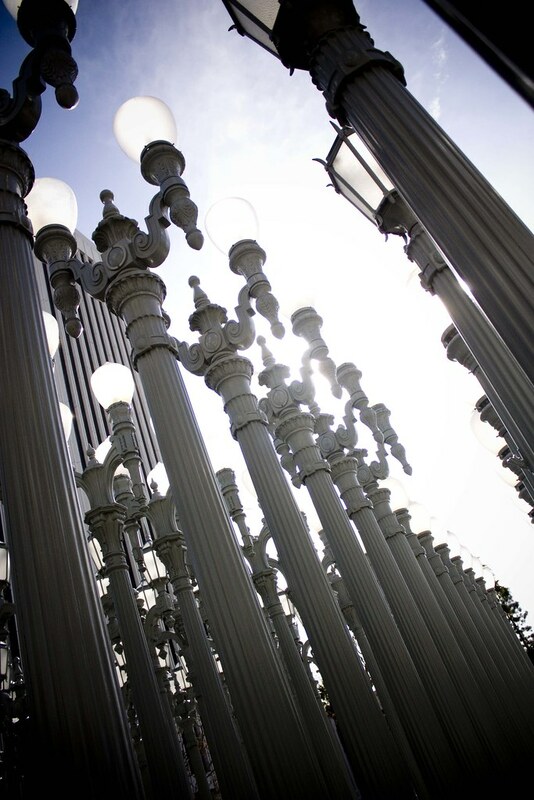 A permanent installation of streetlamps, by Chris Burden, is fun to wander through. 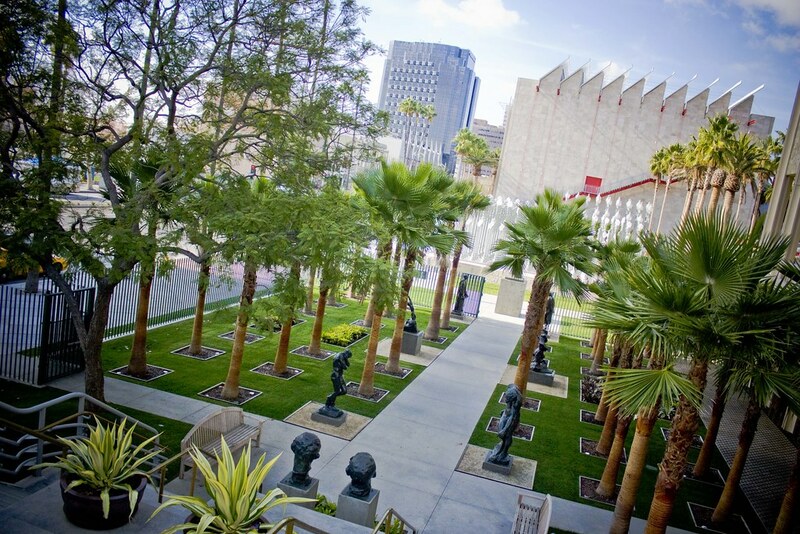 And I loved the gridded sculpture garden filled with Rodin and palm trees. Oh, and the view. If you squint your eyes and look at the mountain just to the right of center, see that white bar? That's the Hollywood Sign. It's so fun to see in person. It's a looming landmark that you look for from all over the city, like the Eiffel Tower or the Emmaus Triangle. You can see a larger image here that shows the sign more clearly. While inside the museum my favorite exhibit was New Topographics, a collection of photographs mostly from the 1970s that showed man-made landscapes. The images showed homes and power lines and everyday built objects. The artists did not shy away from the effect man as a whole is having on the environment. Instead of taking Ansel Adams like portraits of serenity, these photographers showed where we live and images of our everyday life. 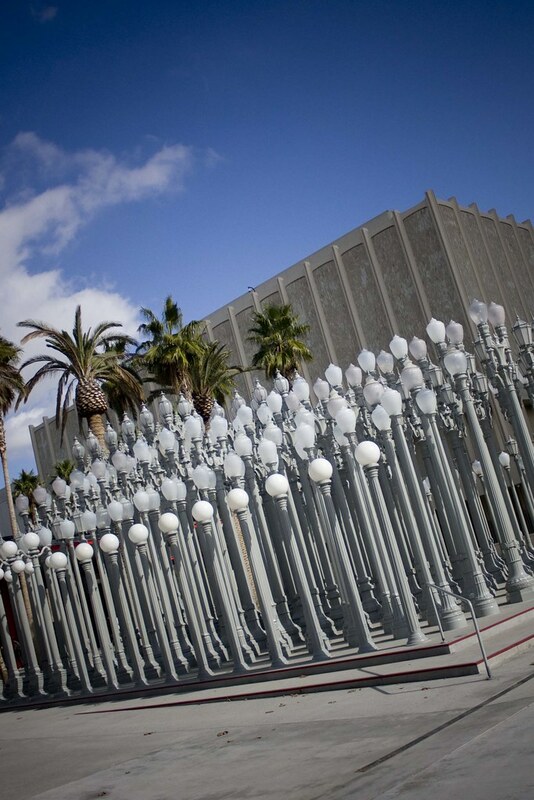 If you are in LA in the next week or so the LACMA is worth a stop. I decide to get a piece of commissioned artwork, and what do I choose as my subject? 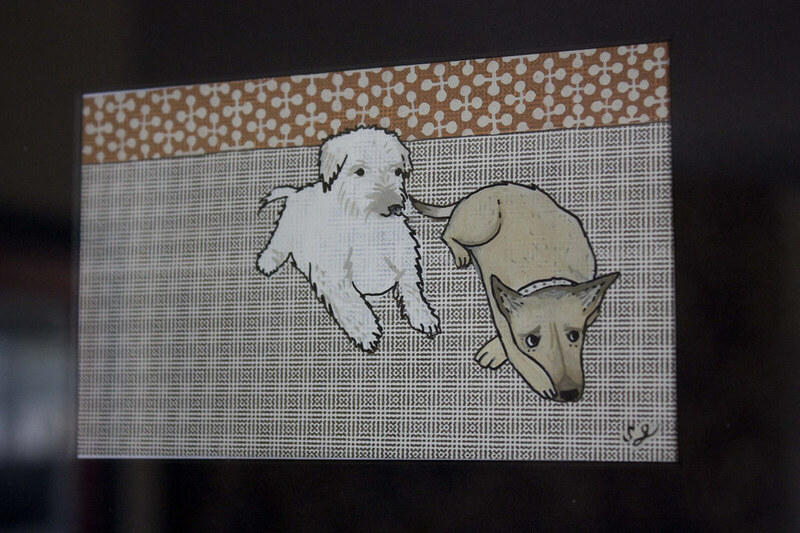 Of course, the cutest doggie duo in the world. Susie Ghahremani launched a fun program called DRAWsome where you can order a custom illustration and it comes right to your home and you can love it forever. This is Susie's interpretation of Henry and Lola waiting for me to finish working so we can go outside and play. I love it because she got it just right, they are always watching me like this. I matted it and framed it this afternoon and hung it up already!